This is yet another of the make-ahead bakes that I make for breakfast on a regular basis. It doesn’t have to be kept for breakfast though, it would also make a fantastic lunch, and is just as tasty cold as it is hot. And you could serve it right away if you were not planning on keeping it for another time. Because this one contains blue cheese, it is not really paleo. This is more of a primal dish. Melt the coconut oil in a large skillet and add the onion. Cook over a medium heat for 5 minutes until the onion begins to soften. Add the bacon and cook until crisp. Add in the sweet potato and zucchini and cook for a few minutes until the vegetables start to soften. Tip the contents of the skillet into a large bowl and mix in the green onion, eggs chilli powder, salt and pepper and blue cheese. Pour everything into a large ovenproof dish and bake in the oven for 30 minutes until the egg is set and the top is browned. Chill and stash in the fridge or serve hot right away. 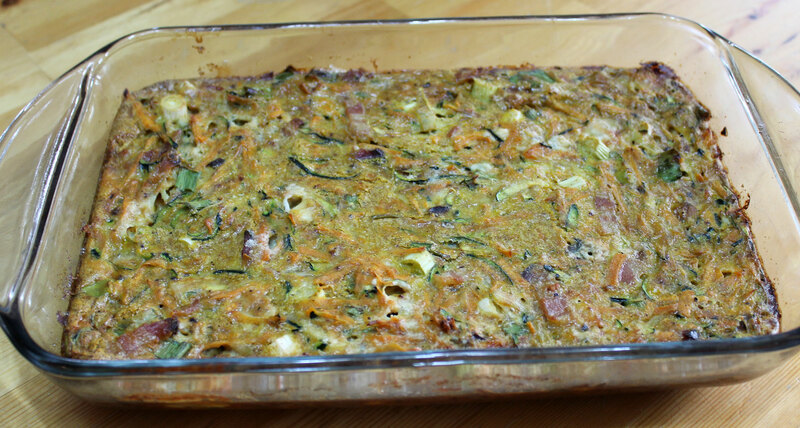 This entry was posted in Recipes and tagged bacon and eggs, bake, blue-cheese, breakfast, gluten-free, grain-free, healthy, low carb, primal. Bookmark the permalink.